How I've overlooked Saratoga Springs all my life, I do not know. To me, it meant a distant race track and some mineral water, but a recent trip into town illustrated a more copious sampling of opportunities than I thought probable. Of course, I was also pulling blindly for a good coffee experience, this time from a place called Uncommon Grounds, what seemed like my best hope in town after much dead end research. My entourage and I pulled up in front of the shop amidst a bustling Saturday morning crowd. Uncommon Grounds resides in a large white brick building with a large awning and alcoves ripe for outside seating in nice weather. The interior was quite behemoth in scope; a large space with a faux-courtyard (or faux-house depending on your view) in the middle with lots of seating in and around it. I made my way to the crowded counter off to the left and ordered a drip of their house blend (they roast their own coffees) and an espresso. The house blend was birthed out of one of their many pump pots; a slightly old, slightly bitter coffee that had bits of tart berry and a relatively smooth body (i.e. mediocre cup). The espresso, pulled of a medium volume had a lot of crema, a chocolate milkshake-ish taste and consistency, followed by a tiger-sized bite of bitterness on the back end. The tea was free leaf. Before I had ventured to Saratoga Springs, I read on a forum somewhere that given the beauty and draw of the area, Saratoga Springs needs a great coffeehouse. 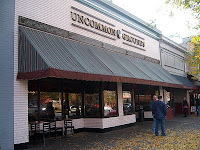 I would venture that given some overhaul, Uncommon Grounds could be that place. If not, the field seems ripe for a savvy newcomer. If you happen to be in town, try out Uncommon Grounds. I always find it challenging to find good coffee when I am in out of the way places like this. Did you find that the experience was pleasant but the coffee just couldn't quite reach your standards? I was at a place in Great Falls, Montana this morning where I love the people, but he inconsistency in the brew was a little frustrating.